Hedgehug tells the story of a hedgehog very excited about the promise of Valentine's Day. Certain he will find love, he emerges from his burrow expectantly and enthusiastically ... perhaps a little too enthusiastically. Hedgehug looks for love in all the wrong places. Just when all seems lost and the hedghug completely defeated in his Valentine's quest, the unexpected happens. 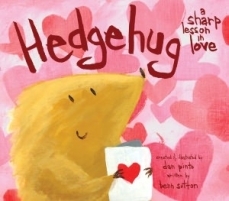 HEDGEHUG is a delightful Valentines book for children and as well as for parents to read aloud to their children. The story is both sad and happy, with a delightful happy ending twist. With words and wonderful artwork, the reader easily relates or gains sympathy for the hedgehug. HEDGEHUG is a wonderful tale about the unexpected, magical twist of love. For those adult readers like myself who love children's books, HEDGEHUG is a must for the Valentine's Day collection... or any day really because it captures so well human experience. While there is a wonderful happy ending, HEDGEHUG also captures some of the heartache of love. HEDGEHUG would make a wonderful gift for any adult who has experienced a disappointment in romance. HEDGEHUG is cute and endearing without being sappy. Delightful!